Is it really possible to build a commercially viable radio network that runs with zero carbon emissions? At first thought, the answer might seem no, especially when you consider that mobile traffic demand continues to climb rapidly. AT&T in the US, for example, claims its mobile data traffic has surged by 250,000% over the last ten years1. That’s huge and there are no signs of a slowdown. The more traffic radio networks must carry, the more capacity they need. That means they use more energy, which in turn generates more carbon emissions. How then can we possibly reduce and even eliminate emissions from all the base stations around the world? It cannot be done overnight. It will take many years. But it is possible. Step by step. Let’s take one example of an incremental improvement. Every new radio unit added to a base station site increases the losses from the DC power cables running up the mast, connecting the baseband units to the radio heads. These losses can total more than 20% of the site’s energy consumption. Reducing DC losses is clearly a step that cuts emissions. We’ve introduced an AC/DC/AC converter that enables the thick DC cables to be replaced with thinner AC cables. Not only are the cables cheaper and easier to install, but their losses run at less than 0.3%, a fraction of the 8.5% typical of conventional DC feeder cables. 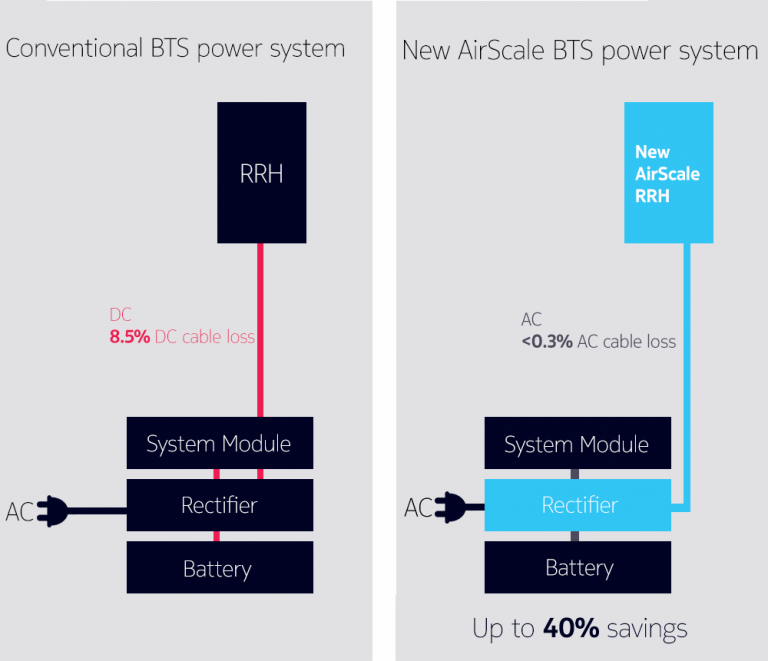 When you add that to the energy savings that can be achieved by using the latest remote radio heads (RRHs), such as the Nokia AirScale 8-pipe TDD RRH, then up to 40% energy savings can be achieved. This translates to 40% fewer emissions. There are currently lots of other ways to reduce base station site carbon emissions – modernizing to Single RAN, upgrading to energy-saving software, using more efficient power electronics and more. There are sure to be further innovations to come. We know, because we’ve got several being developed in our labs. In parallel, progressively installing renewable power generation systems, such as wind and solar energy, on base station sites will further decarbonize radio networks. All these steps will carry us on a journey to zero emissions. Along the way, operators can reap increasing financial rewards as they reduce the size of the energy bills generated by their radio networks. Read more about the AC/DC/AC converter innovation in this blog and download our ebook to learn more about carbon free radio networks.